"If that [Huawei] equipment is co-located where we have important American systems, it makes it more difficult for us to partner alongside them," US Secretary of State Mike Pompeo told journalists gathered at the US Embassy in Budapest. 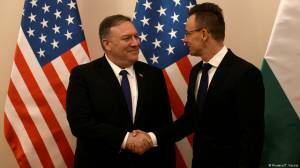 Pompeo was in Hungary for the first leg of his five-nation tour of Europe. Washington is keen to build on its relationship with Central Europe and strengthen the region's ties with the West under increasing pressure from Russia and China. The US is spearheading a drive to ban or restrict the engagement of Chinese firms such as Huawei and ZTE in the West following the company's alleged espionage activities in Poland. Huawei said it dismissed a Chinese worker arrested in Poland on allegations of spying for Beijing. Referring to the killing of Washington Post columnist Jamal Khashoggi inside the Saudi consulate in Istanbul in October last year, Pompeo denied Washington was "covering up" the slaying. "America is not covering up for a murder." He said the US would continue to take "more action, continue our investigation," and would continue to hold accountable all those responsible for the murder.